Directed by François Laliberté. 2008. 42 minutes. English, Mandarin, Mongolian with English subtitles. Study areas: Central Asia, Mongolia, Chinese History, Anthropology, Autobiography. In 1968, Dan Zhang, a Beijing zhiqing (intellectual youth), volunteered to go to Inner Mongolia. It was the midst of the Cultural Revolution, and she was just seventeen years old. As a “sent down youth” from the city, she went through an initial “culture shock” living on Mongolia’s grasslands. But she gradually adapted, making friends with the local people and learning how to live and work as they did. Thirty years later Zhang, who has been living and teaching in Vancouver since 1989, returned to Mongolia where she witnessed dramatic social changes in society and in the life of her old Mongolian friends. This film tells the story of Zhang’s return through her own eyes. 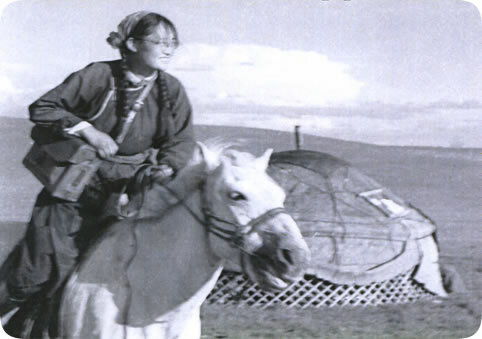 Mongolia: Thirty Years Later provides a personal perspective on two rather different topics: the vast changes in nomadic life that have taken place, and the experiences of a “sent down youth” told in her own words. While the settlement of nomadic peoples in China and the processes of urbanization have often been criticized in the west, in this documentary, local Mongols voice their enthusiasm and pride in what they see as progress, or at least the better living conditions they now enjoy. Although the Cultural Revolution has been often depicted negatively, in this documentary, we see Zhang’s nostalgia for the place where she spent her youth and had the life-changing experiences which shaped her into the person she ultimately became. Presentation of primary materials is well-organized and carefully edited. The use of old personal photos connect well with both the ethnographic depiction of individuals living there today, and the documented history of the state. Clips from interviews with local Mongols avoid the often boring voice-over narration in this genre of documentaries, and provide rich information on the changes in their family life and their views of those changes. The camera captures beautiful natural scenes of wild grassland as well as the details of daily life in Inner Mongolia. The vivid often contradictory images depicting both ethnicity and globalization, -- motorcycles and horses riding together, brick buildings and yurts next to each other, western suits and Mongol robes at one gathering, cell phone users and wrestlers at a Mongol Naadam -- will interest instructors who teach their students about the re-formation of an ethnic community and the impact of globalization upon a people. The film is also useful in teaching about an aspect of the Cultural Revolution that is often overlooked: its influence on China’s “sent-down youth.” Mongolia: Thirty Years Later is useful in courses dealing with personal autobiography, Chinese history and anthropology. The subtitles and captions are clear, which makes the documentary easy to follow for an audience with little or no background knowledge. Many students will identify with seventeen year old Dan Zhang. Shao Dan is an assistant professor in the Department of East Asian Languages and Cultures, University of Illinois at Urbana-Champaign. Her first book titled Remote Homeland, Recovered Borderland: The Manchus, Manchoukuo, and Manchuria (1907-1985) (University of Hawaii Press) will come out in Spring 2011; and her second book project on the history of Chinese nationality law received an ACLS award (2011-2012). Dr. Nancy Jervis is the Program Director of the Asian Educational Media Service (AEMS). She is a cultural anthropologist specializing in film and East Asia, and was vice president, director of education and editor of an award-winning curriculum guide for K-12 teachers during her 20 year tenure at China Institute in New York City.